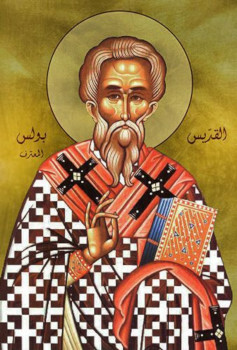 Saint Paul, Archbishop of Constantinople, was chosen to the patriarchal cathedra after the death of Patriarch Alexander (+ 340), when the Arian heresy had again flared up. Many of the Arians were present at the Council which selected the new patriarch. They revolted in opposition to the choice of Saint Paul, but the Orthodox at the Council were in the majority. The emperor Constantius, ruling over the Eastern half of the Roman empire, was an Arian. At the time of the election of the patriarch he was not in Constantinople. Upon his return, he convened a council, which illegally declared the dethronement of Saint Paul, and the emperor banished him from the capital. In place of the saint they raised up Eusebios of Nicomedia. Patriarch Paul withdrew to Rome, where also were other Orthodox bishops banished by Eusebios. Not for long did Eusebios rule the Constantinople Church. When he died, Saint Paul returned to Constantinople. He was greeted by his flock with love. But Constantius exiled the saint a second time, and so he returned to Rome. The Western emperor Constans wrote his Eastern co-ruler an harsh letter, which he dispatched to Constantinople along with the holy exiled archpastor. The threats worked, and Saint Paul was reinstated upon the patriarchal throne. But soon the pious emperor Constans, a defender of the Orthodox, was treacherously murdered during a palace coup. They again banished Saint Paul from Constantinople and this time sent him off in exile to Armenia, to the city of Kukuz, where he accepted a martyr’s death. When the Patriarch was celebrating the Divine Liturgy, Arians rushed upon him by force and strangled him with his own hierarchical omophor. This occurred in the year 350. In the year 381 the holy Emperor Theodosius the Great solemnly transferred the relics of Saint Paul the Confessor from Kukuz to Constantinople. In 1326 the relics of Saint Paul were then transferred to Venice.